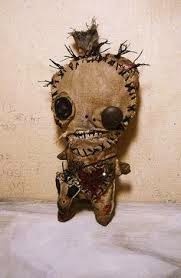 Like Zombies, “Voodoo dolls” are a prominent part of Caribbean myth, and tied to several works that include pirates. 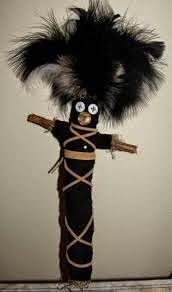 What were these dolls, and how did they figure into the Vodou religion? 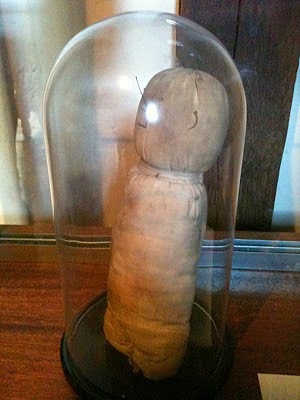 To begin with, this sort of “magical doll” is linked to many more religions. 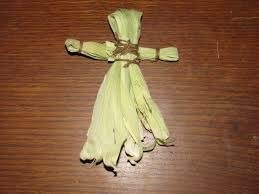 In fact, magical dolls had been a prominent part of Christianity for some time. The principal behind the dolls was pretty universal. If you want to do magic on a person or thing – say, the Brooklyn Bridge or your History teacher – and you can’t actually have that thing around, you make a model, link the model with the real thing through magic, and then work magic on the model or doll. If my target is the Brooklyn Bridge, I’d start out by making a model, keeping as close to the building materials of the original as possible. Of course, if I’m not skilled at model making, I may have to resort to a snap-together plastic kit. Once the model is made, the model and the original must be linked. This might involve painting it with the same type of paint used on the real thing, daubing it with dirt brought from the bridge, adding the poop of pigeons or sea gulls. I’d spend a lot of time Telling my model that it really was the Brooklyn Bridge. Then I’d stage traffic jams on it, or cut cables. Whatever I wanted to happen to the real thing. Conveniently, if nothing happened to the real bridge, it would only mean that I hadn’t linked my model and the original well enough. If a middle school girl has a crush on her history teacher, and wants to create a romance, she would make a doll representing him. Instruction manuals suggested forming the doll out of the loved one’s clothing, or stuffing it with clothing scraps. Identifiers such as glasses, a distinctive belt, hairstyle, etc., would be added. Then the girl would make a similar doll representing herself. The two would be tied together in a loving embrace and then hidden away in a bottom bureau drawer. All of this may seem quite innocent, even silly, But at the time of the Golden Age of Piracy magic of this sort was a very serious business. 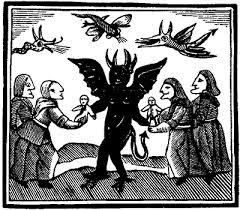 In 1688, during the lifetime of many notable pirates, a woman names Goody Glover was executed for, among other things, tormenting those who had teased and humiliated her by means of “poppets” of puppets. She had "several small images, or poppets, or babies, made of rags and stuffed with goat's hair and other ingredients. When these were produced the vile woman acknowledged that her way to torment the objects of her malice was by wetting of her finger with her spittle and stroking of these little images." Cotton Mather, the same New England cleric who visited and wrote about Bellamy’s crew as they lay in prison after the sinking of the Whydah, also visited and wrote about Goody Glover. In this case, he noted that she "took a stone, a long and slender stone, and with her finger and spittle fell to tormenting it; though whom or what she meant, I had the mercy to never understand." 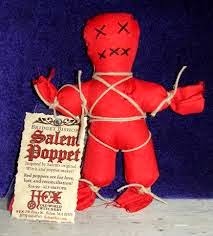 The Salem Witch Trials took place in 1692, and many of those accused were said to have “poppets” in their possession. 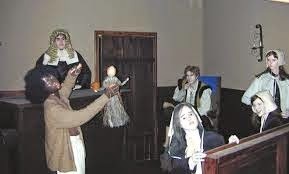 And the original “witch” in the trials was a Caribbean slave woman names Tituba, who was charged with leading several Puritan girls into the forest to teach them magic and dancing – two activities held in almost equal horror by the Elders of the community. It takes little imagination to see the slave-owners of the Caribbean, living in fear of the huge number of slaves held barely under control, projecting their own terrors and traditions onto the Africans. While the Vodou religion remained a lower-class phenomenon in rural Haiti, it became something of a tourist attraction in more cosmopolitan New Orleans. The religion lived underground, but more theatrical priestesses made a fortune catering to rich tourists. If the “trade” wanted love magic, love magic would be produced. If something spookier was called for, a curse would be dreamed up. Sticking pins in “Voodoo dolls” became a thing. One item that made this unique to the culture was the style of the dolls. As we’ve seen before, Vodou alters and statues were folk pieces. They were made by the very poor, and depended more on emotion than symmetry or fine materials. The asymmetrical, cobbled-together look of the dolls gives them a horrifying, alien feel. The last question is, do these dolls work? While no one has ever proved the existence of magic, there are certainly examples of people who knew themselves to be under a curse to wither and die. Like the “placebo effect” which allows a sugar pill to cure some cases of cancer, the belief in magic was all you needed to bring a curse to life.